Jusu, a YouTube user from Helsinki, Finland, made this trailer for the 1979 Disney classic The Black Hole. I've written before about The Black Hole on this blog when I found some cool homemade animation, but this video is worth a second post on a film that amazed me as a little kid. The Black Hole, was one of those films that I grew up with. I am still fond of this film in the same way I am fond of my Battlestar Galactica toys. I might have outgrown them, but they are relics that I cherish from a less than happy childhood. I keep The Black Hole on my DVD shelf the same way I keep old Star Wars toys next to my computer. What makes this film stand out in my memory? I suspect it is because The Black Hole is an film that feels warped and pulled in many directions, much like the nature of space and time in a real black hole. As Disney's first PG-rated film, The Black Hole is filled with strange imagery and content that puts the film in a netherworld between being too intense for kids, but not hip enough for teens or adults. The Black Hole tries to be traditional Disney film in one respect, then a laser-blast shoot'em up in another. The Black Hole reaches back to the style of films like 20,000 Leagues Under The Sea, but incorporates elements of Star Wars as well. The result is a pulp-style space adventure with memorable and odd moments. One weird scene is when idealistic scientist Dr. Alex Durant is killed by the wirling blades of the menacing robot Maximilian. In a reversal of his role in Psycho, it is Tony Perkins' character who is murdered by sharp blades. Another notable aspect of The Black Hole are the mechanical effects used to create space scenes. In the making of the Star Wars films, space battles were fought against blue screens filmed by robot cameras, then matted into starfields later. The Black Hole features space scenes where ships are filmed against starfield backdrops live in-camera. This old-school method of filming effects turns space itself into a character. The stars in these shots are not the standard glowing white pinpoints against a field of black. In The Black Hole, the backdrop is a luminous blue nebula. The effects feel dated in an age where Hubble Telescope images shape our view of the cosmos, yet manage to create amazing widescreen vistas. 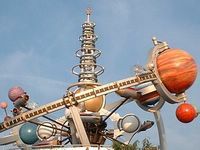 The lead ship, USS Cygnus, looms and glows in a mystical Disney blend of the Haunted Mansion crossed with the rocket-spires of Tomorrowland, creating a haunted rocket park of a far-flung future. Suprisingly realistic are early shots aboard the spaceship USS Palomino. The cramped, Apollo capsule-like Palomino is not the Enterprise, or even Han Solo's Millenium Falcon. Astronauts are crammed into a living space that offers little privacy, designed for computers and equipment instead of people. Everywhere humans are confronted by buttons, keyboards, and viewscreens. Until the crew lands on the cavernous ghost ship Cygnus, there is no artifical gravity. People float in the zero gravity (sometimes with wires showing) aboard a ship that twists and rotates around them. The viewer is forced to adjust to space the same way an astronaut would, with no up or down as the camera simulates a spinning ship dragged by the cruel gravity of a black hole, echoing directionless interior shots Apollo 13 depicted years later. The crew is forced to land on the Cygnus to repair the oxygen supply. The USS Palomino is not the warhorse spacecraft of other Sci-Fi films. After being mauled by high gravity, the Palomino is crippled in the same way the command module of the Apollo 13 mission was. The Palomino, for all its gear and technology, is a delicate metal shell barely protecting the crew from harsh deep space. Later on in the The Black Hole, bad science takes the helm and creates campy moments. Meteors roll down ship corridors like bowling balls. People float in airless space harmlessly without a helmet in sight. Yet for the first half-hour, The Black Hole has some strong space geek appeal. Jusu's trailer is way better than the original trailer that was released in 1979. It clearly demonstrates editing is an art that can restitch an old movie, taking a film you have seen a billion times and transforming that movie into a new tapestry of images. ...now if only V.I.N.cent the robot did not look so much like a toddler's toy.